Saw these yesterday in Poundland Wednesbury. Usually at least double the price everywhere else!! Lol of course milk has bcaa's in it! But you're right, comparing milk to a drink designed to be a bigger protein hit is just silly. Might go to wednesbury and pick up a few. Even though I'm cutting. Do they keep well? How would you find this? 75p in my local B&M. but still to expensive imo. Not quite the same. You'd have to drink at least 750ml of milk just to match the protein alone. Seems like a good deal. I would vote that HOT! Do Discount Supplements not deliver to your door then...? Just some clever wording and some people are so easily tricked into buying something for an inflated price. There is no added BCAA's, what it says is "naturally contains BCAA's". Asda could quite easily add those words to their milk, would you then pay three times the price for it? These bottles contain 30g of milk protein for a quid, Asda sell 4 pints of milk for a quid and that gives you 82g of protein. Ok so you'd have to drink more volume and consume a few more calories (although you wouldn't be poisoning yourself with sweetener and flavourings) but people shouldn't be fooled into paying way over the odds for a product like this, these companies are preying on the not so bright with more money than sense. Just some clever wording and some people are so easily tricked into … Just some clever wording and some people are so easily tricked into buying something for an inflated price. There is no added BCAA's, what it says is "naturally contains BCAA's". 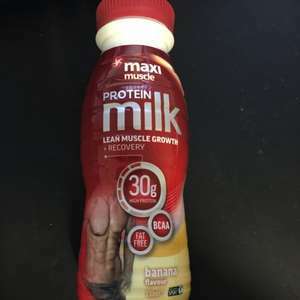 Asda could quite easily add those words to their milk, would you then pay three times the price for it?These bottles contain 30g of milk protein for a quid, Asda sell 4 pints of milk for a quid and that gives you 82g of protein. Ok so you'd have to drink more volume and consume a few more calories (although you wouldn't be poisoning yourself with sweetener and flavourings) but people shouldn't be fooled into paying way over the odds for a product like this, these companies are preying on the not so bright with more money than sense. How exactly do flavours poison you? Note how all you see on the label is "flavouring", with no info as to what that is exactly. When all you see is "flavouring", you have to ask yourself why are they so frightened of detailing what exactly that flavouring is. They'll fob us off by saying it's because the chemical names would be meaningless to consumers, but that's just it, chemicals. As well as the flavourings and the sweetener, there's also Carrageenan in this. Stick with milk, cheaper and much much much better. They don't expressly break down the flavourings because it's proprietary knowledge. Not because they don't want consumers to know. Carageenan is an interesting one, but the evidence is not overwhelming. No, of course all chemicals aren't bad, but many are, and if those used in a product aren't being revealed it makes me suspicious. Faced with paying an inflated price for something like this Maxi Milk drink that contains Sucralose, Carageenan, and 'flavourings', all of which MAY be harmful, or simply opting for milk that is cheaper and doesn't contain all that, should be a no brainer, but people are tricked by clever wording into thinking they're buying some kind of miracle product because it's marketed as a protein drink that naturally contains BCAA's. No, of course all chemicals aren't bad, but many are, and if those used … No, of course all chemicals aren't bad, but many are, and if those used in a product aren't being revealed it makes me suspicious. Faced with paying an inflated price for something like this Maxi Milk drink that contains Sucralose, Carageenan, and 'flavourings', all of which MAY be harmful, or simply opting for milk that is cheaper and doesn't contain all that, should be a no brainer, but people are tricked by clever wording into thinking they're buying some kind of miracle product because it's marketed as a protein drink that naturally contains BCAA's. True, but it does contain more protein than milk. If it was just flavoured milk, with no added value, then I would agree wholeheartedly (not with the "bad chemicals" bit, but with the marketing fluff). People are paying for the added protein, the flavour and the convenience of not having to mix a shake on the go. Also the fact that its ambient stable, unlike most milk. True, but it does contain more protein than milk.If it was just flavoured … True, but it does contain more protein than milk.If it was just flavoured milk, with no added value, then I would agree wholeheartedly (not with the "bad chemicals" bit, but with the marketing fluff). People are paying for the added protein, the flavour and the convenience of not having to mix a shake on the go. Also the fact that its ambient stable, unlike most milk. It doesn't contain more protein than milk though. Yes on a volume basis it contains more per 100ml, but the added protein is milk protein. You can get 4 pints of milk for a quid and that has 82g of protein, whereas this product for a quid only contains 30g. Sure it's a convenient product, easy to take to work or to the gym or have one in the glovebox, but it's really not that difficult to just pour some milk in a handy sized bottle. It doesn't contain more protein than milk though. Yes on a volume basis … It doesn't contain more protein than milk though. Yes on a volume basis it contains more per 100ml, but the added protein is milk protein. You can get 4 pints of milk for a quid and that has 82g of protein, whereas this product for a quid only contains 30g. Sure it's a convenient product, easy to take to work or to the gym or have one in the glovebox, but it's really not that difficult to just pour some milk in a handy sized bottle. That's the most ridiculous argument I have heard for a while. It has the same amount of protein as milk, you just need to drink x times as much... So it doesn't have the same amount, it has less. How can I stop milk from going off in a glove box? All the greatest bodybuilders of yesteryear managed perfectly ok without all todays supplements and the main staple of the diet was milk and eggs. I met Lou Ferrigno once and he said in his prime he was drinking 2 glasses of milk with every meal and 5 meals a day, and in those days that was whole milk. Arnold was an exception as he famously said "milk is for babies, men drink beer", but for most bodybuilders and athletes milk was big. The problem nowadays is that everyone wants an easy option, they don't want to eat big and work hard, they get blinded by the fancy words and marketing from big supplement companies and they'll buy anything and pay anything for products that they think will give them results quicker and easier. I'm not knocking all supplements, I take supplements and have done for many years, but you should be getting as much of your nutrition as possible from food, supplements should be just that, a supplement, not a substitution. Milk is a fantastic food source, and it's cheap. The arguement that it doesn't keep doesn't stand up, as you can get the ultra filtered stuff now that keeps longer. I can understand some people not wanting the sugar content if it's for a genuine reason but for most people the sugar in negligible, it's only around 20g per pint. It's a natural form of sugar called lactose, it's a healthy sugar as it converts to glucose slowly and therefore keeps your blood sugar levels stable, and your body uses sugar for energy so it's an essential. I drink 6 pints of milk every day and have done for 30 years, I have no issue with the sugar content, my blood glucose is normal (5.1 at my last medical, which is bang on as anywhere between 4 and 6 is normal).